Latching compact relay with magnetic hold - 3 CO contacts - 3 or 5 A.
Pluggable on sockets with possible hold down springs - pins at the standard pitch of 2.54 mm. Pluggable on the following sockets : EVB/GE, 9877, EVC/GE, 9876, ER/GE 2.8 or ER/GE. * Pulsed : pulse duration > 0,1 s - < 2 mn. * Permanent : requiring an external auto cut-off device (GCD) with pulse >= 2 min. 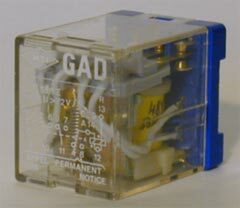 Number of contacts 3 inv.
. GADFN low-level relay with cover sealed under neutral gas.
. GAD relay with specific characteristics (voltage, current, frequency).